I fear what I CAN change and who I CAN become. I neglect myself in spite of myself for an ever growing list of reasons that even I can not begin to decipher. I keep repeating the same thing to myself over and over but I never follow through. I never follow up with the person who is most important. I am the least important. I never give myself the respect that I give to others. I never give myself the respect I deserve. I never let my voice to be heard. I never give to myself. I float from idea to idea never grabbing the concrete that built it. I let them all drift away and fill the sky up with new ideas. I repeat the same cycles over and over. I love often with contempt. 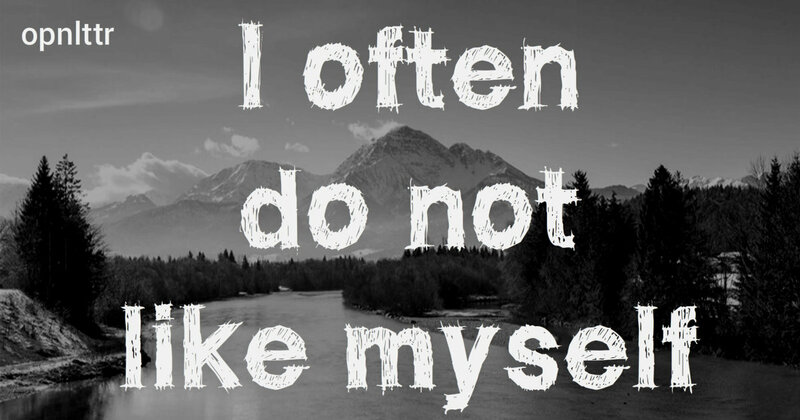 I often do not like myself. I throw judgement upon others. I am judged by others, I am judged by myself. I am quick to have discontent towards those who judge as I cautiously judge the same. I am discontented in myself. I am afraid of running out of time. I am afraid I will never reach my full potential. I am scared that I will regret my past choices as they sculpt my future dreams. I am scared of being afraid. I am afraid that people will find out everything that makes up the real me. I am afraid that I, myself, do not truly know the real me. I morph my reality to fit in with others. I am a loner in a crowd. I am lost on a path I chose to take. There are many paths to take, each with its own set up twists and forks. To choose a path is to start a journey, to reach a goal. There are many paths to choose. Choose to commit to a path and follow it through, navigating the forks and overcoming the obstacles that arise. I am afraid to commit, I don't want to miss out on an opportunity. I never commit anything to myself. I take the path of least resistance and loathe myself for the choice. I work hard on things are not important. I work hard for others. I never work hard for myself. I never work hard on myself. I work hard on picking apart others. I work hard on picking apart myself. I often do not feel important. I am bringing my family down with me and it saddens me. I can only act for so long and pretending is getting harder. I am happy with my current family dynamic. I feel they are not happy. I do not think they are truly happy. I can change, I can follow the path. I can learn to love myself and who I am. I can work hard on myself. I am afraid of myself and my potential. I am afraid I will fail at myself. I am scared this will be read by someone else.